Stratos is known as one of the great pearls of functionalist architectural style in Oslo. It is also one of the most popular venues in the city for conference and banqueting. 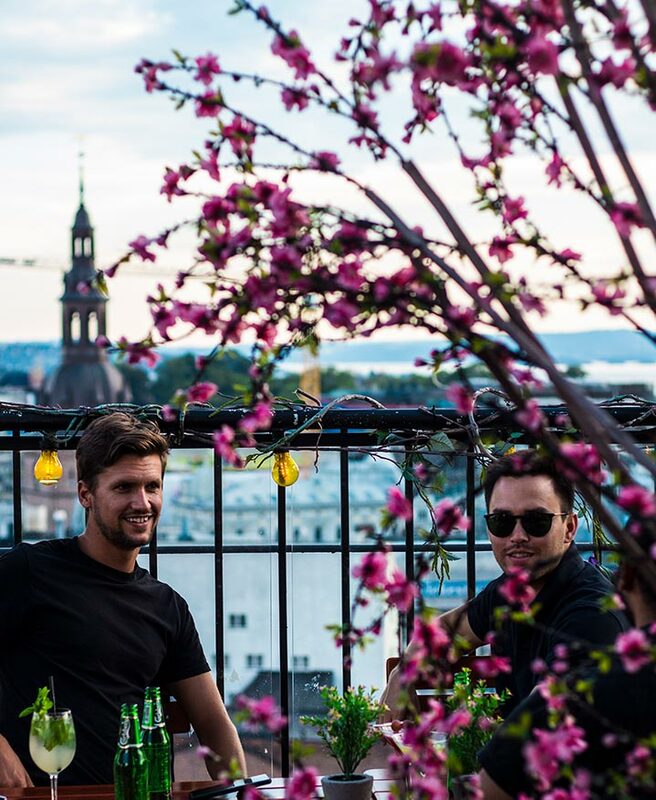 Located at the top of the famous Folketeaterbygningen in old town Youngstorget, Stratos serves you a breathtaking view of our beloved city from our popular rooftop terrace. Imagine celebrating your wedding "up in the sky" with a spectacular view of Oslo and all the sights. We can make your dream come true! Stratos gives you the perfect location for your wedding or other celebrations. Enjoy a lovely 3 course dinner while you watch the beautiful sunset through the large windows that cover the whole wall. We can offer different banquet packages, or you can order a menu that is more suiting for your celebration. Do you want to see our venue, or are you considering renting it for your celebration? Please contact us, we are here to serve you. If you´re looking for a great conference venue downtown Oslo, you'll see that Stratos is the perfect place. Our venue covers two floors, and it´s therefore a practical place to host a full day event with conferences and seminars in one floor, and lunch at the other floor. With small changes, the venue can easily transform from a daytime conference, to a lovely dinner setting. This, in addition to its private and undisturbed location on the top of Youngstorget, makes Stratos extremely flexible. We can easily adapt and are happy to give you any suggestions if you are uncertain. Each summer, from the end of June to mid August, we open our spectacular venue for guests and throw a summer club from Tuesdays to Saturdays. This is a perfect opportunity for everyone to enjoy the breathtaking view from our rooftop terrace. In the weekends we have the best DJs from Norway and other countries playing dance music. We don't serve food at our summer club, unless you pre-book our barbecue buffet (which is highly recommended). Stratos is also a beloved place for summer parties and birthday celebrations. If you have any questions about this, don't hesitate to use our contact form.